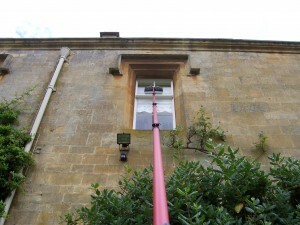 Pole fed window cleaning within easy reach! Reaching windows that are impossible to clean using ladders is easy with pole fed equipment! Uneven ground or tricky access with ladders can be a risky endeavour. DMC window cleaning based in Droitwich only use top quality water fed pole equipment to take the risks out of cleaning windows that ladders cannot reach. Here is a view of a quality pole at used with no damage to the property or person. Please contact Duncan at DMC window cleaning have your windows cleaned using the best equipment by a professional.